Includes table and four dining room chairs. This Magnolia Home camber metal table and mesh back chairs create an industrial 5 piece dining set that dreams are made of and RC Willey has it. The modern industrial accent of the simple mesh-back metal dining chairs complemented by the rugged planked tabletop on this dining room table gets a lot done with a little bit of space. This gorgeous dining room set will last you and your family for years of meals, games, crafts, homework, and much much more! 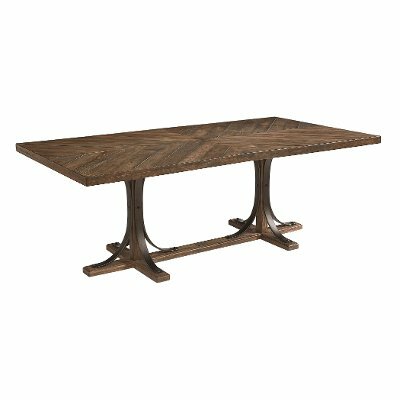 Incorporate traditional style into your dining room with this timeless Magnolia Home Furniture iron trestle dining table, now available from RC Willey. With its curved metal base paired with a V-match planked top in a worn and rugged Shop Floor finish, this table combines unique and classic details into one eye-catching piece. 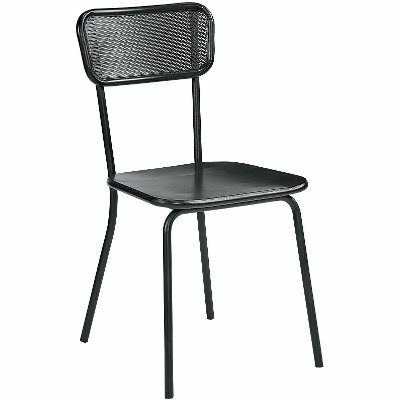 This Magnolia Home Furniture mesh back metal dining room chair from RC Willey will bring a contemporary industrial style into your dining room. This chair is not only stylish but is also comfortable and easy to clean with its simple and chic design. You'll love this chair wherever you choose to use it in your home.